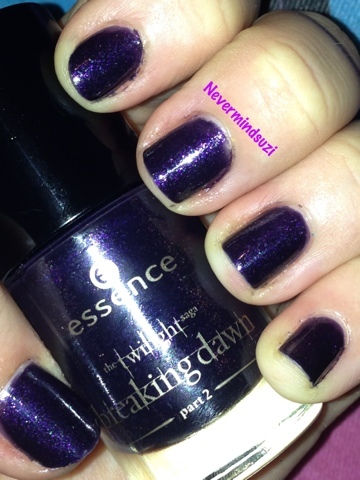 So recently I was able to pick up another few Essence polishes and I was happy to nab 2 from the Breaking Dawn Collection. The first one I have to show you is called Alice Had A Vision - Again. 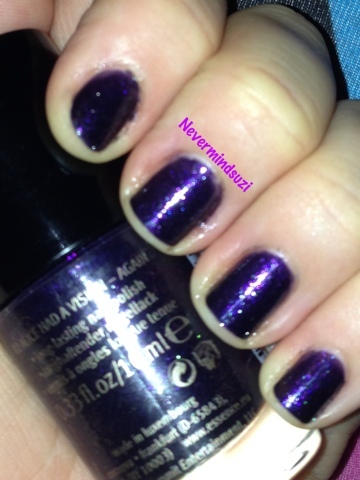 This is a deep purple polish with a magenta shimmer running through it. The polish formula was fine and 2 coats gave full opacity, however I'm not a lover of the brushes. They try to be like the OPI brushes in terms of width, but in terms of quality, the end was tapered slightly but not evenly, and as someone with small nail beds this caused a bit of a mess, so I spent a fair bit of time on clean up. Thankfully though once it was cleaned up it was very pretty and actually reminded me a little of Nails Inc's Bow Street (though not as bright a magenta shimmer). Apart from the brush issue I'm glad I picked this up. I'm quite a fan of the Breaking Dawn polishes, I've just tried Jacob's Protection and apart from being a bit gloopy, its a lovely colour and the subtle glitter is awesome.